All Mid-Atlantic Knife slitter knives are manufactured from the finest quality of steel which includes tool steel, high speed steel and tungsten carbide. All slitters are designed to provide a clean, dust free cutting operation. 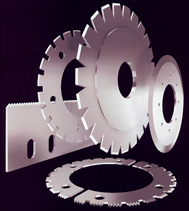 Mid-Atlantic Knife serrated cut-off knives are manufactured for all domestic and foreign built web presses. They are available in straight (V) tooth or slant (RIP) tooth designs, serrated, and beveled on one or both sides. All knives are precision manufactured to assure consistent tooth size and burr free cutting edges.